The season finale for the CW’s Supernatural ended on an epic note. And rather than being downplayed, it was visually shown in all its glory. Read on if you already watched, or if you don’t mind knowing last season’s finale. The season finale ended with Metatron finishing the angel trials and casting out all the angels, who literally fell from the heavens onto earth. And sadly, he also stole Castiel’s grace, who now remains powerless. Now joining for season 9 is actor Tahmoh Penikett, best known as Helo on (one of the greatest shows to ever grace television) Battlestar Galactica. Penikett will portray a warrior angel named Ezekiel — maybe this means he will fall in love with a human and have a Nephilim together. 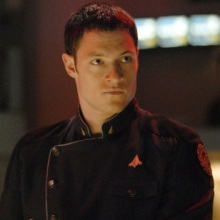 I enjoyed Penikett’s work on both Battlestar and Dollhouse. He brought a sincerity to his roles on both shows, and it’s something he can channel for the dignified angel, Ezekiel. Supernatural returns on the CW on October 8, at 9 PM. Yes, that’s right, the series has found its way back on Tuesday nights. I am excited.